(64804/64801) -- We know an issue has been the City of Joplin dumping HUMAN WASTE stinking up the AIR SHOW. Anyone have any specifics to mention? I have also heard people say that they've seen dumping in the middle of the night and also around other areas of town? Can you be specific in comments below? We have to have REAL people and REAL information if we are going to attend this public meeting. 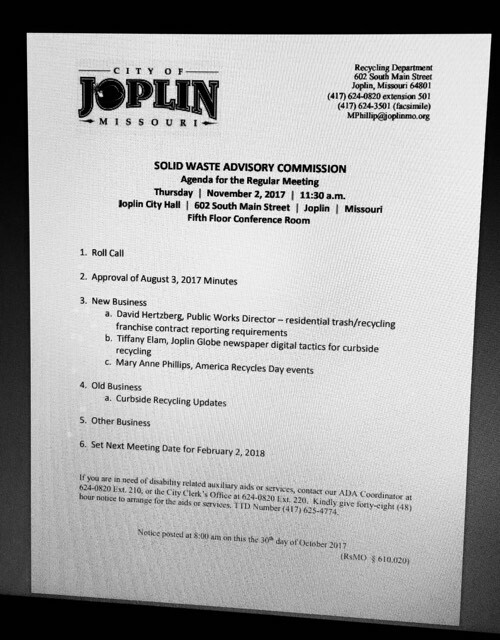 Zev and I are thinking about attending this meeting but we'd need some personal information from residents of Joplin. Thursday | November 2, 2017 | 11:30 a.m.
JOPLIN, MO – The Empire District Electric Company has scheduled a brief service interruption for portions of the Downtown Joplin, Missouri, area on Sunday, October 29, 2017, beginning at 1 a.m. and lasting approximately two hours. Customers should be aware these times are approximations and the outage could be postponed or extended due to weather or equipment issues. Approximately 700 customers near Downtown Joplin will be affected by the service interruption. The impacted area is shown on the attached map. This scheduled outage is the result of substation maintenance and is necessary to ensure the safety of those involved. This project is part of an ongoing initiative to strengthen the delivery system and enhance reliability for customers. We thank customers for their patience as we complete this work. (64804/64801) -- It's going to FREEZE tomorrow night! So tomorrow/Friday during the day you need to close the vents around your house near the foundation. Cover any plants or bring them inside. And make sure your heater is working. Here are the details from Meteorologist Doug Kramer in the National Weather Service Center in Springfield with an update for us in Joplin and the region. ©2017 Joplin News First is sponsored in part by Joplin Tax Service, East 32nd across from Applebee's. 'Get the Max at Joplin Tax'. $2,500 Stolen In Minutes - Do You Recognize These Brazen Thieves Captured on Camera? This is a post from the @Joplin ODOR Issues Group on Facebook. Anyone have lung issues, breaking out in hives or rashes, chronic fatigue flared up since these PUTRID stench(es) have plagued Joplin? Let's keep in mind that Jasper Products HAVE received their 3rd ODOR violation now (Oct 12). But they still are allowed to operate and are dumping their waste into the City of Joplin Sewers. It is now a known fact that the vapors from the sewers are what is smelling up the town. And the City all along have known this and have allowed the sewers to be used and these odors permeate the City. But the City is blaming weather patterns???? Unacceptable. https://en.wikipedia.org/wiki/Bronchiolitis_obliterans by working with and being exposed to 'butter popcorn flavoring' in their Jasper MO plant in the 90s. Sadly these employees never can get rid of this chronic disease. Not even through lung transplants. It's been more than 10 years so we are not sure of the mobidity of these Jasper Products employees/victims. State Sen Ron Richard, State Rep Bill White and Joplin Chamber of Commerce applaud Jasper Products recently for their expansion in Joplin too. http://www.workforcezone.net/author/kris/ — ￼wondering about your health? Hi. I'm from New Mexico, but grew up in Joplin. I've been a wastewater systems operations specialist for over 40 years. I learned about the sludge (biosolids) disposal issue in Joplin this week when a friend asked me about it. You guys need to be calling the Mo Dept of Natural Resources enforcement folks to complain, not the city. They can investigate and determine if regulations have been violated. I have included the contact number in the response post. Here's my response: After reading the article I made some phone calls and ran some basic design calculations related to sludge production for a system Joplin’s size. I believe that something dramatic happened at the treatment plant. So do the regulators I spoke to today at NMED and MoDNR. And the City may have left out some of the details regarding the situation. Joplin owns 45 acres that is used for sludge (Biosolids) disposal. Most large municipalities do. They also have a permit from the Mo. DNR that allows them to land apply those solids. They recently admitted to dumping 400,000-500,000 gallons of those solids on the property in one week. There are significant odor issues at the disposal site. I’m assuming here that Joplin has an anaerobic (like a heated septic tank) digester process to treat their sludge. A plant the size of Joplin’s should produce about 12,000-15,000 pounds of raw sludge each day. That sludge goes to a set of digesters, where they should achieve a 65% reduction in organics over 30-45 days. So they get 4,000-5,000 pounds of organically stable biosolids out of the process each day. That represents about 4000-5000 gallons of treated sludge (10-12% solids). That sludge should no longer produce the objectionable odors because all of the easily degradable organics have already been stabilized. It is routinely applied to disposal fields without more than a musty compost kind of odor. So why are there odors? If the sludge is not properly treated the remaining raw organics will continue to breakdown anaerobically after application and release those offensive “sewer gasses.” The admission that they felt compelled to put out half a million gallons (probably more) of “treated” sludge in a week is highly unusual. The trucks that spread it hold 2000 gallons, so that’s 250 truckloads in a week or 35 loads a day or one every 45 minutes. Most experts would say that you would only do that if there is some kind of emergency. But the city didn’t say they had a problem. A system this size would have a digester capacity of about 400,000-500,000 gallons. That means they dumped a volume of sludge equal to everything in the digesters. That’s not very likely because no one holds that much “treated sludge” on-site. Or they emptied their digesters, which is not properly treated biosolids, for some yet unknown but very serious reason. I believe it was the later. First there needs to be some detective work. The way we determine if digester sludge is properly treated is to check the pH. If the pH is at or above 7.0, the sludge is considered to be biologically stable. If it is below 7.0, there are still undigested organics present that will cause the odors. So, if we can get a “soil” sample and check the pH, we can determine if “raw” sludge was applied. If it’s below 7.0, they dumped improperly treated sludge. This should be done soon, as the pH will rise as the breakdown runs to completion. There could also be a health-related containment issue if runoff leaves the property. Maybe a TV station can get one? The next step is to contact the SW Regional office of the Missouri DNR in Springfield and log a complaint against the City. They will send an enforcement agent to investigate. If they dumped improperly treated waste and didn’t tell MDNR they have violated at least one regulation. There are criteria that must be met to prove that the sludge is properly treated. The testing needed to make that determination must be documented. Dumping improperly treated sludge may also require a special permit, with special criteria for disposal, from the State. If they didn’t get one, that is also a violation. If they dump substandard sludge on the site it must also be injected below the surface or plowed under within six hours of application. This is done to minimize odors. I’m guessing that didn’t happen here. And I think they are lying about the volume. They should know within 1% how much they applied because it must be logged in their monthly reports to the State. 400,000-500,000 gallons is way outside their margin of error for reporting. They should know that number to within a few thousand gallons. I talked to the head of the certification office at MDNR today. When I told him what I had learned and suspected, he agreed and suggested that you guys get in touch with the Regional Office in Springfield to file a complaint and request an on-site investigation. The number for the Springfield Office is: 1-417-891-4300. First, try to get in touch with Tina White. She is the Section Chief for Enforcement. If you can’t get her, then try her boss, Kevin Hess, Environmental Manager. He must have thought it could be a big deal if he gave me the Regional Manger’s name. UPDATE: I went to the WW website and found that I underestimated the flow. I did not include flows at the Turkey Creek plant. That means my sludge production numbers are incorrect and low. That doesn't negate the disposal issues though. That 500,000 gallons of sludge is still 250 tons of solids in a week. Sorry. I should have done my homework better. (64801) -- Power has been restored to the portions of downtown Joplin affected by an electric pole that has fallen victim to the blustery 45 mph winds this morning. Thank you to The Empire District Electric Company, MoDOT Emergency Response Team, Joplin Fire Department and Joplin Police Departmentfor working to coordinate traffic and asessing the situation quickly. (64801) -- Portions of downtown Joplin have no power including the stop light at Route 66/7th & Pearl and 7th & Wall. This is a very dangerous situation use extreme caution. Cars approaching the intersection are coming to near accident many times. As vehicles traveling from the West along Route 66 approaching downtown they aren't slowing down because traffic signals are dark. Empire has no report of power outages on their website. (64801) -- Joplin Police Department spokesperson, Capt Trevor Duncan updates Joplin News First on the scene as darkness falls over the neighborhood. The home at 1414 West 5th is confronted by loudspeaker that can be heard repeatedly during the live!cast. There is one suspect in custody who was being sought on a juvenile warrant for shots fired yesterday at Joplin's Parr Hill Park. In that incident two neighbors there were grazed by gunfire on South Kansas Ave. One on the arm and another above the ankle, breaking her skin, but neither requiring medical attention. It was then determined a juvenile warrant would be issued for the suspect who was taken into custody tonight. Officers and detectives from our department went to 1414 West 5th at 5:43pm on 10/23/17 in an attempt to contact the juvenile suspect from yesterday’s shooting at Parr Hill Park. One of our officers was driving down Maiden Lane and saw the suspect in the front yard of the residence and called for assistance to arrest him as he turned around and went back. While officers were on scene, the juvenile suspect ran on foot to the south behind the house. As the suspect was running south with officers chasing him he fired shots. One of our officers returned fire. The suspect was taken into custody to the south near Highland Dairy without further incident. Neither he nor the officers were injured. There were concerns that there was another person in the house that could cause harm due to the suspect’s actions yesterday and today, and the SWAT team was activated. Shortly after 8pm, it was determined nobody else was in the house. The juvenile suspect that was taken into custody tonight after the shooting is the same juvenile suspect we have been seeking since yesterday for the Shooting at Parr Hill Park. He was arrested on a juvenile warrant that was issued for him for yesterday’s shooting and transported to the juvenile detention facility. Further charges will be pending. We are not seeking any other suspects involved in either incident. The Missouri State Highway Patrol responded at our request to investigate the officer involved shooting. Per department policy, three officers who were on scene are being placed on administrative leave. The Missouri State Highway Patrol also worked a crash at 7th and Range Line where one of our K9 officers was struck while responding emergency to the shooting incident. The officer wasn’t injured and the K9 sustained minor injuries. Thank you to the Jasper County and Newton County Sheriff’s Departments for covering regular calls in our city during this incident. Thank you Capt Trevor Duncan for keeping the media & public informed. Chief Matt Stewert and the JPD SWAT as well as Missouri Highway Patrol and Newton County Sheriffs Dept. To realize another potentially deadly situation was handled with only minor injuries of a K9 in a vehicle crash responding to the call. (64801) -- Capt Trevor Duncan of the Joplin Police Department have confirmed they have one suspect in custody, of whom they had come to investigate the whereabouts at a home near 5th and Maiden Lane. This is directly related to the Parr Hill Park shooting yesterday. (64801) -- Joplin Police Department acting on known information went to a residence at 1414 West 5th Street seeking a juvenile suspect in the Parr Hill Park shooting yesterday. Upon arriving at the residence around 5:45 pm they came upon the juvenile and received gunfire as the juvenile attempted to flee. Joplin Police officers responded in defense. The entire area from 4th and Maiden Lane to 7th and Maiden Lane was cordoned off as JPD quickly took him into custody without injury to anyone. As Joplin News First observes firsthand JPD SWAT was activated and they were suited in full tactical gear with rifles in hand. It was determined that there could be another person inside the home, 1414 W 5th St. 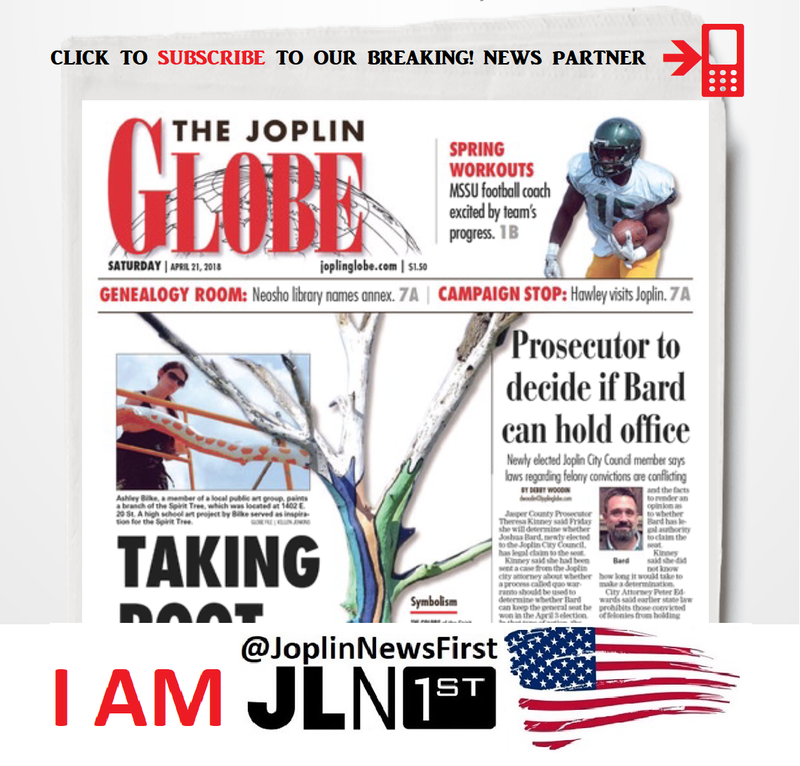 In Part 1 Joplin News First is the first reporter on the scene with breaking news, thank you to our tips from our amazing followers: Cheyenne H, Davis R, Delisa, Greg McP and others we might have missed. (64801) — Joplin Police Department are advising the public to avoid the area along Maiden Lane from 2nd to 7th. It’s an active Police situation. Firsthand JPD can be seen with rifles in hand combing the neighborhood. Eyewitnesses at the scene are saying this is related to the Parr Hill Park shooting incident yesterday afternoon. Possibly a police standoff with a suspect on 5th street. Police activity is getting very heavy. Officer seen with rifles. Joplin fire department and EMS are on standby down the street.